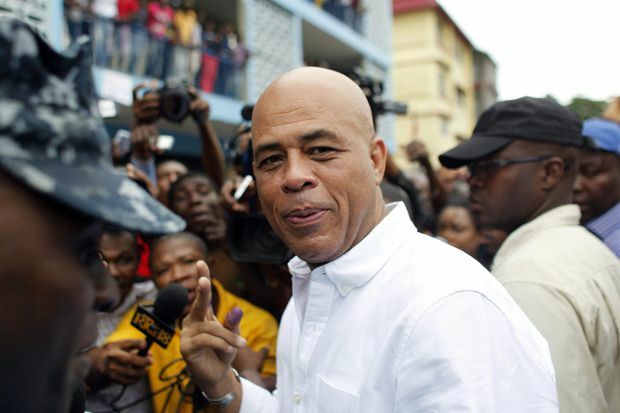 In this 2016 filephoto, Haiti's former president Michel Martelly poses after voting in the Petion-Ville suburb of Port-au-Prince, Haiti. A controversial concert scheduled for Friday night in Montreal by former Haitian president Michel Martelly was called off at the last minute. The show’s promoter, Carl-Edward Osias, confirmed the cancellation to The Canadian Press. Mr. Osias did not want to explain the reasons behind the move, saying he would leave that to Mr. Martelly. Critics of Mr. Martelly, who performs as Sweet Micky, had called on municipal and federal authorities to block the show, citing what they say are his misogynistic comments and his alleged complicity in corruption scandals. Mr. Martelly had a singing career before entering politics. He served as president of Haiti from 2011-16. Mr. Osias said earlier this week that protests against the concert were being fuelled by Mr. Martelly’s political opponents and those who don’t understand that Sweet Micky is a stage persona.